Small grab hooks. Set of four. 1/25th scale. MPC by ROUND 2 MODELS. 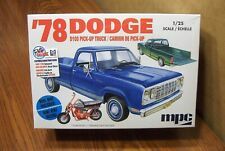 '78 DODGE D100 PICK-UP TRUCK w/MINI-BIKE. 1/25 Scale. Skill Level 2. 1/25 ERTL MACK DM 800 WITH REX MIXER. Condition is New. Complete kit. Some parts loose. Missing one decal. Windshield has a slight bow in it from being packed up for years. Make offers. 1/87th scale. Older promotional from Promotex. I think this looks big for 1/25th scale. Older promotional vehicle produced in China set-up to have batteries installed underneath for the working lights. This has never been done. Boom goes up and down. Produced by AMT in 1:25 Scale. This kit does not include the Tractor shown in photo. Contains One Trailer. Can be used anywhere on the model because it dries clear as glass. Plastic Model Kit. There are many other reasons and I would love to share them with you if you are interested. This is a Italeri 1/24 Iveco Fiat 190-38 Cowboy Cabover Tractor Truck Plastic Model Kit. Stock # 767. Item is brand new in the sealed box. 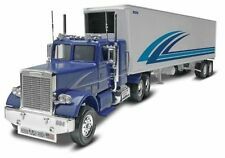 Here is a new 1/24 scale low boy trailer by NEW RAY Toys. Made of a tough plastic with rubber tires. 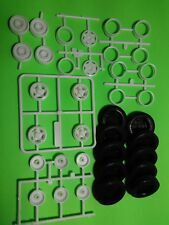 Included are 3d printed D rings( 10) and 3d printed outriggers (16) See pictures, with a little work and scratch building this trailer makes a great model for your 1/24 or 1/25 scale model truck. 8” scale model truck curved tip stacks with bottom elbows. 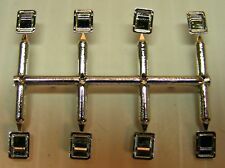 these will work great on any 1/25-1/24 scale mode truck you maybe building. You get a pair of stacks and 4 mounts. The model truck in the pictures is not included. Highly detailed custom sleeper cab. Paint masks aid in creating authenticity in color and design. Black vinyl tires. Easy access to batteries and cables through removable battery box cover. It's a skill level 2 (paint and glue are Not included) The box shows a little wear but is still sealed in plastic. AMT #880 Lowboy, dropdeck lowbed trailer. Sealed. 1/25th scale. Italeri #3857 Peterbilt 378 Long Hauler. Untorn cellophane. Also window material, headlights, and instructions. Vitesse B-61 Mack Plenti Grand. 1/43rd scale. Vitesse B-61 Mack Plenti Grand. It's in the original display case except one end of the lower portion is broken. If you look really close at the photo on the passenger side on the top front corner of the roof there is a very small chip. This is a set of polished aluminum full fenders, The fenders in the picture have a protective film on them. These work with most 1/25 and 1/24 scale model trucks These are not for a real truck! Model truck in the pictures is NOT included! MPC 38418 1/25 scale Hurst Hemi Under Glass 1966 Plymouth Barracuda model kit. Still factory sealed! Highly detailed plastic pieces molded in white and clear. Detailed rear door panels, including roll-up style door an optional double door. Waterslide decals. Optional refrigerated unit included. Auslowe #SK1 - Resin cast RSX Mack Bogie suspension. 1/25th scale. Auslowe #SK1 - Resin cast RSX 65,000 lb Mack Bogie suspension. Factory sealed, near pristine kit, no tears in cello. If there is a problem, we will take care of it! Made by Mill City Replicas, one of the most experienced casters in the market, beginning in the 1980's. This generation of Ford's cab over design is one of the most used workhorse trucks around. We enable you, as a modeler, the opportunity to make distinctive models with the level of accuracy and quality demanded by both discerning hobbyists and professionals. "RD Trucking" lettering on side of cab, CW McCall information in box and replicated signature on side of tanker. I've never had this out of the box. The Kats at AMT know that big rig modelers love to display complete semi truck models. Promotex/Herpa #6570 Peterbilt COE 3 axle with lowboy. 1/87th scale. Promotex/Herpa #6570 Peterbilt COE 3 axle with lowboy. This great kit was made by Revell SnapTite Models. Kit is complete and unbuilt in original factory sealed box. It's original box is in good sealed condition showing age/storage wear and minor crushing. The Construction Bulldozer is a dream for detail-oriented modelers. One of the most unique model kits ever created! • very unique subject. Super duty Kenworth for all your heavy haul needs. Including pushing and pulling that super load. Produced by Revell in 1:24 Scale. Can be used anywhere on the model because it dries clear as glass. Plastic Model Kit. 50 Piece Kit. Paint and Glue Not Included. Almost 8" Long. Polished aluminum drop bumper for the 1/24 model truck kit. These work great on the Peterbilt, Freightliner, and Mack kits, will also work well on the Western Star 4900 &4964 kits. These are not for a real truck! Kenworth K-123 Cabover. 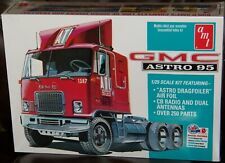 Plastic Model Truck Kit Produced by AMT in 1:25 Scale. Can be used anywhere on the model because it dries clear as glass. 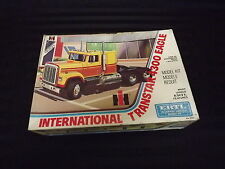 Plastic Model Truck Kit. Plastic Molded in White unless Otherwise Noted. Very nice Dozer ! Sold as is ! It's a skill level 2 (paint and glue are Not included). The plastic body however is prepainted. The box is still sealed in plastic. The box shows a little wear (a little dented,etc). #1176 Midwest Specialized Trans KW T2000 53' Van. Trucks N' Stuff. Older promotional model produced by Al Koenig before he sold out to ATS. Mint in the box. 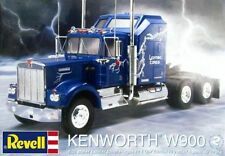 Revell 1/25 Peterbilt XXL Wrecker Service Will-Do wrecker decals junkyard. 1 used Decal set only as pictured. Sold as is ! (No Peterbilt emblems and no dash Decal otherwise complete for truck and wrecker body) several sets available. Kit# 866 ON SALE! LIST PRICE: 41.25 USD. •Glue assembly, paint required. •10 hollow vinyl Firestone truck tires. • Over 250 parts, more than 70 plated. CLASSIC WESTERN STAR 4964. 1/24 Scale Model Kit. Skill level 5. Length: 34.0cm. Produced by AMT in 1:25 Scale. Contains One Trailer. Build with Log or Structural Beam Load. Can be used anywhere on the model because it dries clear as glass. (Log and Beams are 13 1/4" Long). This kit does not include the Tractor shown in photo. KIT FORM SERVICES TQ-52 TRACKED EXCAVATOR 1/24 SCALE.